1. Joseph Smith said he was sent by Jesus as he wrongly believed following the Pauline theological concepts. He thought that Jesus had died on the Cross; he got resurrected from the dead; making Jesus a god or son of god. Factually speaking none of the above ever happened. 2. Jesus did not die on the cross; so there was no question of his resurrection from the dead. Jesus was put on the cross but he was delivered from it in near-dead position. He was treated for his injuries in the tomb of Joseph of Arimathea; when he got recovered enough to travel he went out of Judea taking refuge along-with his mother Mary in Kashmir, a serene land of fountains and scenic beauty in India; thus saving his life from his Jewish and Roman enemies. Paul was a personification of both of these enemies in one. Joseph Smith was killed so in terms of OT Bible he is not a truthful prophet; he was not sent by God; and since Jesus died a natural death in India and a dead man cannot send a prophet or messenger; hence Joseph Smith was not a truthful person/claimant. It is because Atheism has grown in the West in reaction to the mythical creeds invented and spread by Paul in the world. The Pauline Christians cannot defend “Christianity”; the real teachings of Jesus could be defended; and most Atheists could revert to religion. Please try on these lines. Why a large boulder was placed on the entrance of Jesus’ tomb? I have noted some points in the opening paragraph of your post; and I will discuss them one by one. A large boulder was placed as Jesus was inside the tomb and was in unconscious conditions due to the injuries inflicted on him on the cross, though he was being treated by Nicodemus, a physician, with the ointment prepared by him from a large and unusual quantity of herbs Aloe and Myrrh, healing weeds, as mentioned in the Bible; nevertheless; I think, the boulder was placed at the entrance of the tomb at night; so that some wild animals like dogs or jackals etc don’t endanger life of Jesus in the tomb whether unconscious or after treatment in his sound sleep. I appreciate the efforts of disciples of Jesus while they were busy doing their utmost to save the injured Jesus by his treatment in the tomb of Armathea. I made following comments on the blog “Leading Malaysian Neocon” of Scott Thong ; topic “The Locked Tomb Mystery – Whodunit?”. 1. Jesus did not die on the Cross; he survived a cursed death on it. 2. Jesus was treated for his injuries inflicted on him on the Cross in the tomb of Joseph of Arimathea. 3. When Jesus’ injuries on the Cross were healed to the extent he could make a journey; he came out of the tomb and he met his disciples secretly to tell them that he survived and is the same person with the same body he had before he was put on the Cross. 4. Then he went to Galilee; he did not and could not ascend to heavens; instead he secretly going up the hill went towards India; along with his mother Mary. 5. Jesus traveled to India in search of and to meet the ten lost tribes of house of Israel who were settled in different parts of India. 6. The book provided the root map of Jesus travel to India. 7. Jesus visited different part of India and ultimately settled in Kashmir, India. 8. He died a natural and physical death in India; and his grave is still found at Mohalla Khanyar, Srinagar, Kashmir, India. 9. Jesus is not to come again literally and physically and his symbolic Second Coming has been fulfilled in the person of Mirza Ghulam Ahmad 1835-1908. It is a small book of about 122 pages. Crosses mark the graves. The cross on the right is the alleged grave of Jesus Christ. Sign explaining the legend of the grave of Jesus Christ, in Japanese. Shingō village is the location of what is purported to be the last resting place of Jesus, located in the “Tomb of Jesus” (Kirisuto no haka), and the residence of Jesus’ last descendants, the family of Sajiro Sawaguchi. 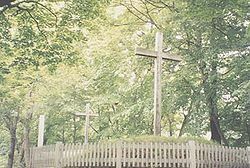 According to the Sawaguchi family’s claims, Jesus Christ did not die on the cross at Golgotha. Instead his brother, Isukiri, took his place on the cross, while Jesus fled across Siberia to Mutsu Province, in northern Japan. Once in Japan, he became a rice farmer, married, and raised a family with three daughters near what is now Shingō. While in Japan, it is asserted that he traveled, learned, and eventually died at the age of 106. His body was exposed on a hilltop for four years. According to the customs of the time, Jesus’ bones were collected, bundled, and buried in the mound purported to be the grave of Jesus Christ. Another mound near the alleged grave of Jesus is said to contain an ear of the brother of Jesus and a lock of hair from Mary, the mother of Jesus, the only relics of his family Jesus could carry when he fled Judaea. The claims started in 1933 after the discovery of supposed “ancient Hebrew documents detailing Jesus’ life and death in Japan”  that was supposedly the testament of Jesus. These documents were allegedly seized by the Japanese authorities and taken to Tokyo shortly before World War II and have not been seen since. When Jesus Christ was 21 years old, he came to Japan and pursued knowledge of divinity for 12 years. He went back to Judea at age 33 and engaged in his mission. However, at that time, people in Judea would not accept Christ’s preaching. Instead, they arrested him and tried to crucify him on a cross. His younger brother, Isukiri casually took Christ’s place and ended his life on the cross. Christ, who escaped the crucifixion, went through the ups and downs of travel, and again came to Japan. He settled right here in what is now called Herai Village, and died at the age of 106. On this holy ground, there is dedicated a burial mound on the right to deify Christ, and a grave on the left to deify Isukiri. The above description was given in a testament by Jesus Christ. I have just quoted from the Wikipedia; everybody is free to make search and find the truth; no compulsion. These concepts have nothing to do with Jesus or his truthful teachings. Jesus was a Jew and was never a Christian and he believed in the one true God and the truthful religion. So, modern Christianity with all its denominations that believe in the three aforementioned concepts is false as admitted by Paul. The truthfulness of Christianity solely hangs on the belief that Jesus of Nazareth was crucified under Pontius Pilate, died and was buried and on the third day he rose again leaving an empty tomb. If this is not true, Christianity is false, period. Most Christians believe that Jesus rose again leaving an empty tomb through the internal work of God’s Spirit. But is it possible for a Christian to be prepared to make a defense to anyone who asks her for the sensibleness of her belief? Can a Christian, with love, gentleness and respect, present a persuasive historical case to show that it is rationally justified to believe that Jesus rose again from the dead? Yes, Jesus did not resurrect from the literal or physical dead; he recovered from the near-dead. Jesus resurrection from the literal and physically dead is a myth carved by Paul; it has nothing to do with reality. Jesus did not resurrect from the dead as he did not die on the cross in the first place; he was delivered from the Cross in near-dead position; he was treated for the injuries inflicted on him on the cross secretly by his friends in the tomb of Arimathea; when he got recovered that he could travel he left Judea and traveled to India along with his mother Mary. The four Gospels of the New Testament of the Bible tell us, that some 2000 + years ago a particular man who was actually the son of the creator of the universe was executed in a terrible fashion by the Roman empire. The story goes on to tell, that after three days he resurrected from the dead. There are millions of people in the world who think this story is true. That it is an historical description of actual events. Bible is not written by Jesus or dictated by Him; it is written by anonymous and sinful scribes; so it is not in-errant. One big example of its being errant is its failure to record that Jesus did not die a cursed death on the Cross. Jesus survived and migrated to India. This one example shatters the myth of the inerrancy of the Bible. Just with this truth the edifice of Christianity comes to the ground.